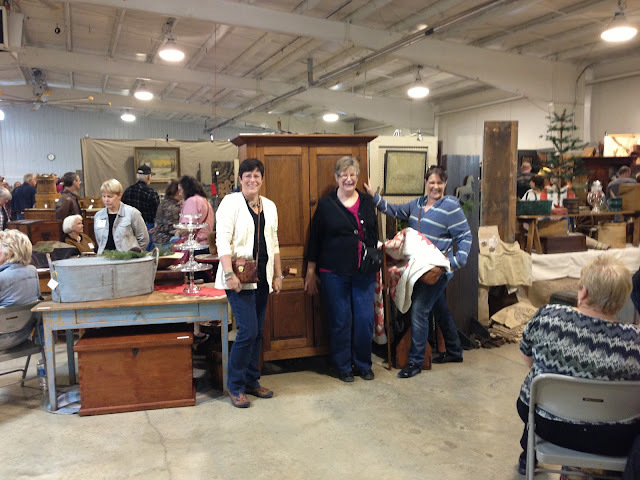 Several weeks ago, three of my dearest friends and I headed down state to shop the antique fairs. Lynne Hagmeier (Kansas Troubles Quilters) drove in from Kansas, and we spent several days gabbing, eating and literally shopping until we dropped every day. What a blast! For those of us who love the gems of the past, this was a wonderful experience. There's something to be said, so hard to put into words, about being around old, old things. If only they could talk....what stories they would tell. Wouldn't we love to ask quesitons like.... Who made you? Where did you live? What are you, exactly?? Who has cared for you until I got the chance to see you today? How did you get those scrapes and gouges? What a fine patina you have! I know...I'm weird! Sometimes you round the corner and find your heart skipping a beat over a treasure you've only seen in magazines.....like this Sparking Lamp. (See my post from a week or so ago.) Yes...the price tag is $335.00....which also makes my heart skip...not the same way, if you catch my drift. 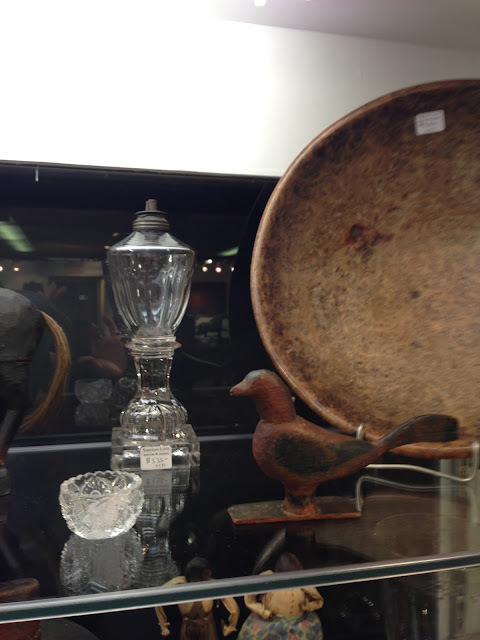 Or...the burled wood hand carved treen bowl, over $1000. A thing of beauty I'll just have to admire from afar. Did you know the term "treen" or "treenware" basically refers to an object like a bowl, spoon, platter, pedistle, etc, that has been hand carved from wood? Burled wood is from the knot in a tree....making it a very, very hard wood. The knot doesn't have the straight line grain you normally see in wood, instead it's mushed and blotched together giving it a truly lovely look. How big the knot of that tree had to be in order to carve a large bowl from it! Remarkable. 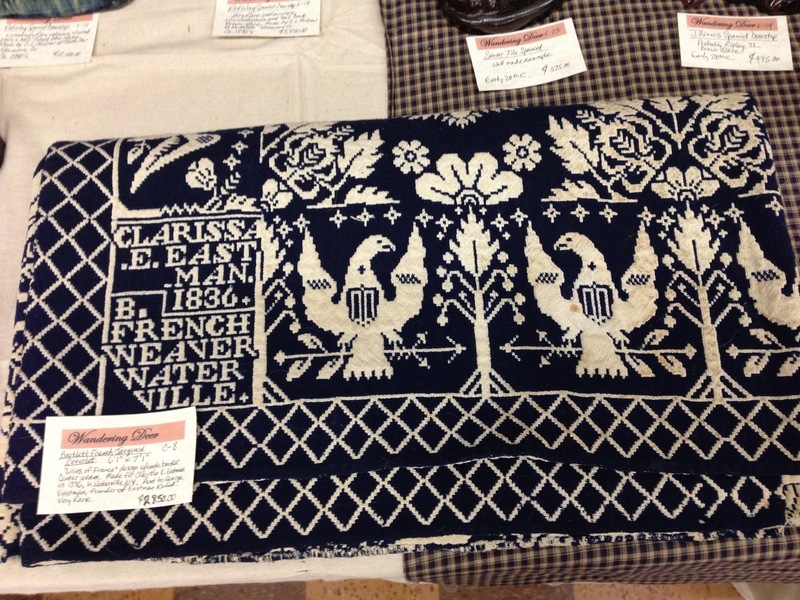 Textiles were also well represented as with this coverlet signed and dated 1836. Only $2850! Isn't it a treasure? Nope...this didn't make it home with me either, but I sure did linger, and touch, and wish, it too, could tell me its story! 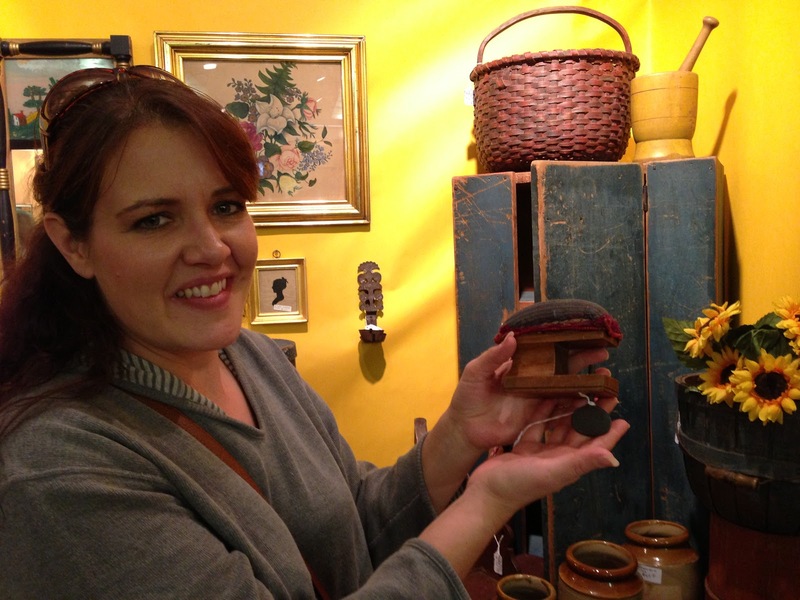 We found a few antique sewing items here and there, like the handmade pin cushion with clamp that Tara is holding. How sweet it is! 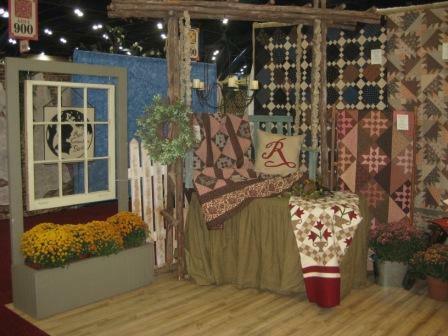 Loved the clothes and this worn and loved Log Cabin quilt. Sure does look like it once lived on the open prairie, doesn't it? I guess you could say we found some treasures to take home with us. Best part was getting to hang out with each other, share the weekend, and do a whole lot of laughing. Can't wait to do it all over again! 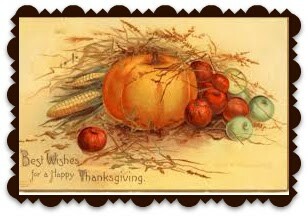 Thanksgiving with many blessings to come! There are several good things coming from three of my fellow designers that I really think you'll want to know about. After all....what kind of friend would I be if I didn't share the news with you??? First up is Lisa Bongean of Primitive Gatherings. 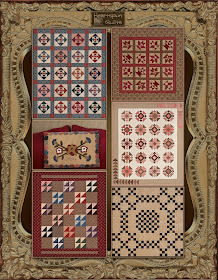 Tomorrow, Thanksgiving Day, starts Lisa's annual Thanksgiving Freebie event at the quilt shop and for on-line customers as well. Make a $25 purchase and receive three.....count 'em....three freebies!! 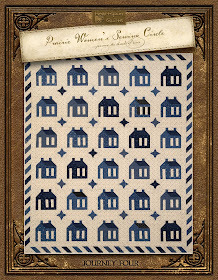 Click here to read all about it and see the adorable freebie projects! I adore the wool wintry scene with the red pick-up truck. Love, love, love. Click here to shop on-line! Have fun...there's lots of goodies to buy. Hop on over to my friend, Tara Darr's blog (Sew Unique Creations). 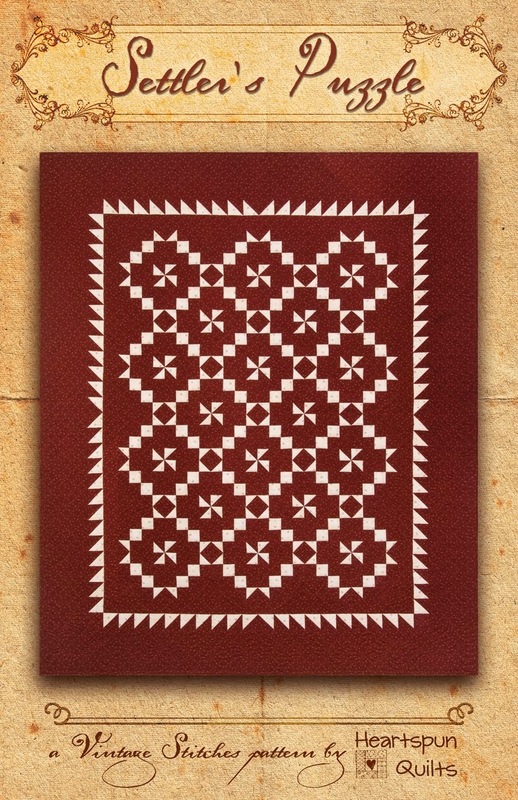 Tara is the first of 12 primitive/wool designers participating in this Christmas Blog hop. Each designer will have a Christmas ornament, cookie recipe, and decorating ideas to share. Tara's blog also gives the dates and other designers line up....so save the dates! I won't miss it, and I sure want you to join me! Sounds like a great time, don't you think?? Click here for all the hop info! She has really out done herself!! We're all gonna have to wait until next summer to get our hands on the book, but it will be worth the wait. No doubt Tara's blog will keep us informed on her progress. If you were lucky enough to have retreated there before, then you know exactly why I'm so JAZZED!! It was the best retreat EVER!! If you missed out on retreating there the first time around....here's your chance to experience it for yourself. Why is the KTR so special? Well.....nearly everything surrounding you is antique or vintage. The beds (not the mattresses or pillows ~ teehee! 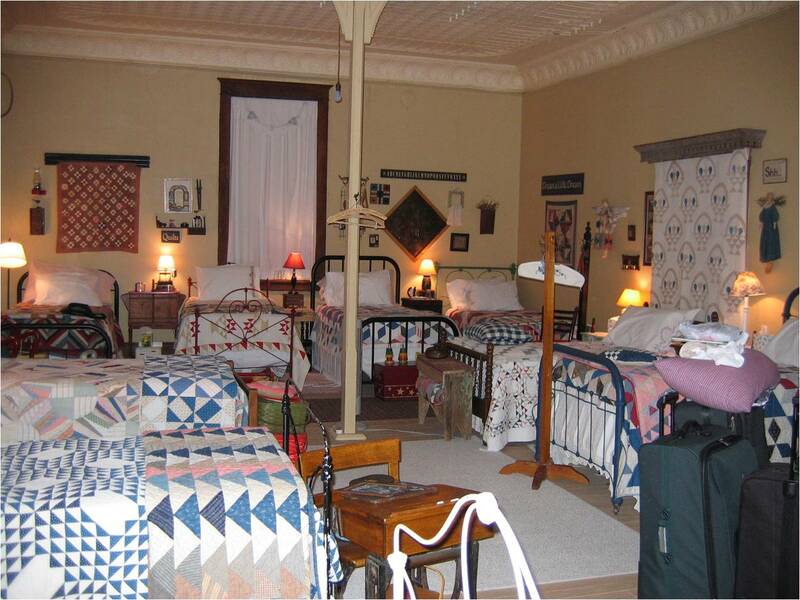 ), linens, and quilts are all vintage. YUM! Night stands and decorations....vintage! Lynne has old restaurant-ware plates and vintage glasses for you to use ...so fun....and you're surrounded by really cool "old things" everywhere you look. There's also a Kansas Troubles store in the building as well. You sew in a spacious room, with a comfy seating area to sit in when you want to relax, stitch or read. Click here to get all the info directly from Lynne. I hope I've given you a few things to look forward to. I know I'll be shopping at Primitive Gatherings tomorrow morning, and starting Monday, I'll be blog hopping throughout the holiday with all the talented prim designers, and very soon, I'll be booking my next KT retreat sometime in 2013. Wishing You Man Happy Stitches....and mouse clicks! Well....it's just been too long since I've had a chance to post. 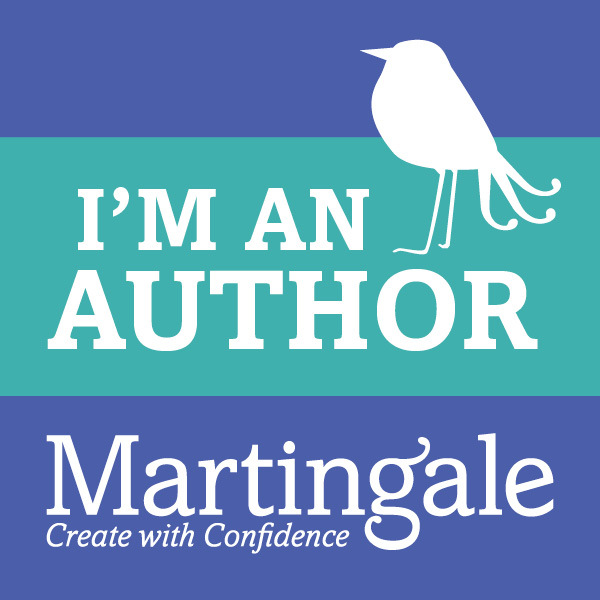 I've missed all of you, dear readers! When last I posted, I promised a report on my trip to Indiana, to Back Door Quilts, and to visit with the Bloomington Quilt Guild. Back Door Quilts in Greenwood, IN. 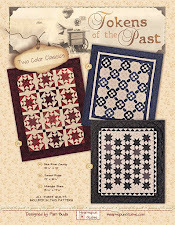 Linda & Teri have owned Back Door Quilts for 25+ years. The shop is over the moon wonderful, chock full of samples, samples everywhere. There's so much there to inspire you!! I'll let the photos speak for themselves, but trust me...don't miss this shop if you're anywhere in Indiana!! Isn't it amazing how many goodies are in this shop? There truly is something for everyone. They carry every imaginable fabric, and if by chance there's something you need that they don't have, they will be happy to order it for you. 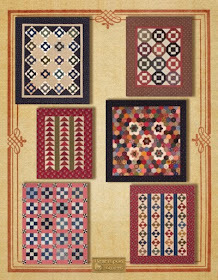 The moment I walked in the door, I was surprised to see very familiar quilts on the ceiling!! 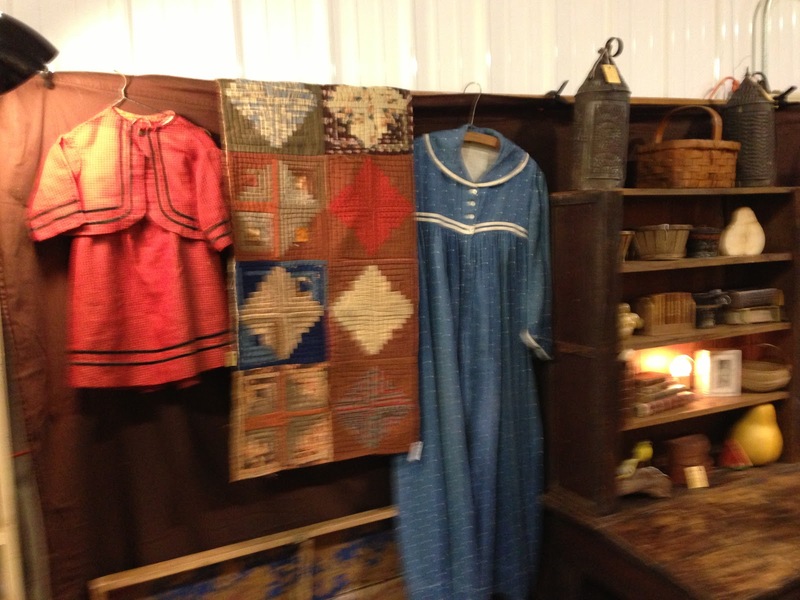 The shop girls display a few of the Prairie Women Sewing Circle projects on the ceiling. building across the parking lot. 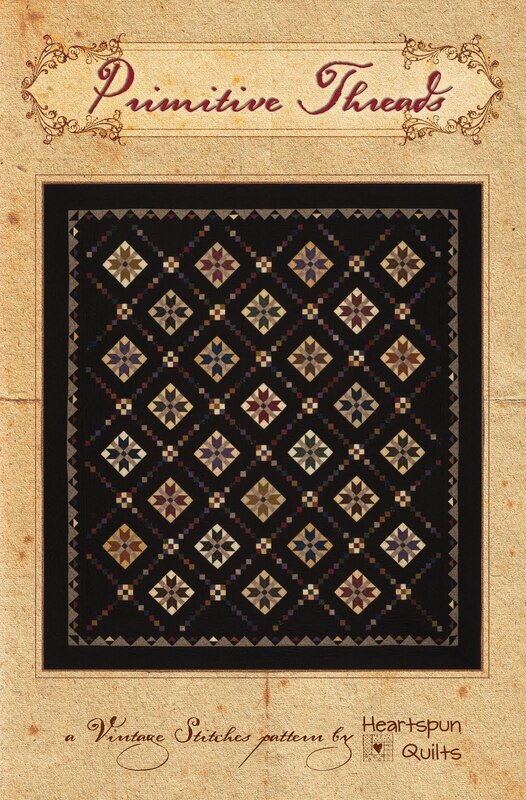 It, too, is full of wonderful quilts. They have a large and very active group of Prairie women at the Back Door! I have posted photos of their show-n-tell on numerous occasions. As well as this Christmas tree decorated in a variety of my Wee Whimsies block quilts all done in Christmas greens & reds. So cute! I can't wait to go back!! Thanks to Linda, Teri and all the shop girls for allowing me to linger for many hours, and for making me feel so welcome! 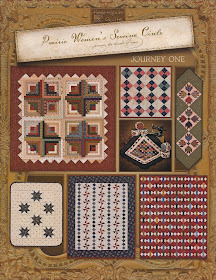 and showed several suitcases of my quilts from magazines, patterns & Prairie Women. The next day was spend with these lovely ladies in my workshop Practice What I Preach. They were all very fun, warm and generous, and I thoroughly enjoyed my time with them. 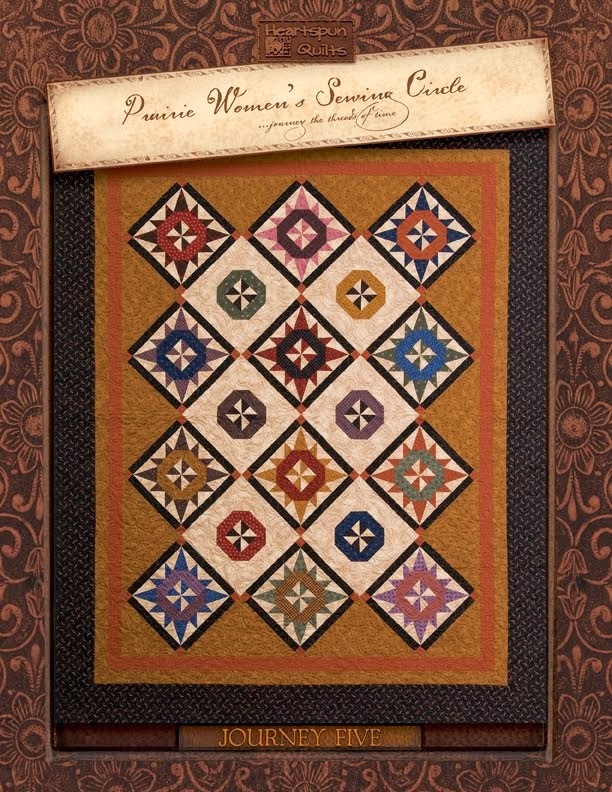 There are a whole lot of very, very talented quilters in this guild!! I thank them so much for allowing me to spend some time with them all!! Truly, you just can't miss spending the day with quilters!! The deadline is November 30th.....only 11 days away!! I am back home from my wonderful trip to Indiana. 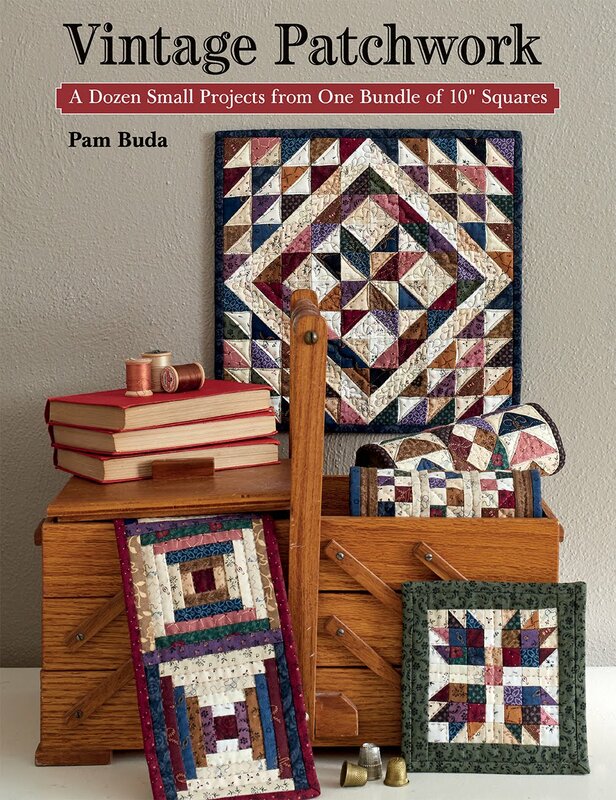 I arrived at Back Door Quilts Tuesday afternoon and spend a few hours there pouring over every nook and cranny full of delicious quilty things. It was my first time there and I had plenty of time to linger and take it all in. 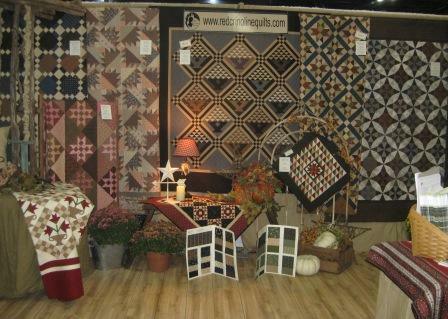 Then, I spent Tues evening and all day Wednesday with the ladies from the Bloomington, IN Quilt Guild. I took lots of photos for you to enjoy and had every intention of posting them today, but time just got away from me. I'm only home for 24 hours before I head out on another adventure. 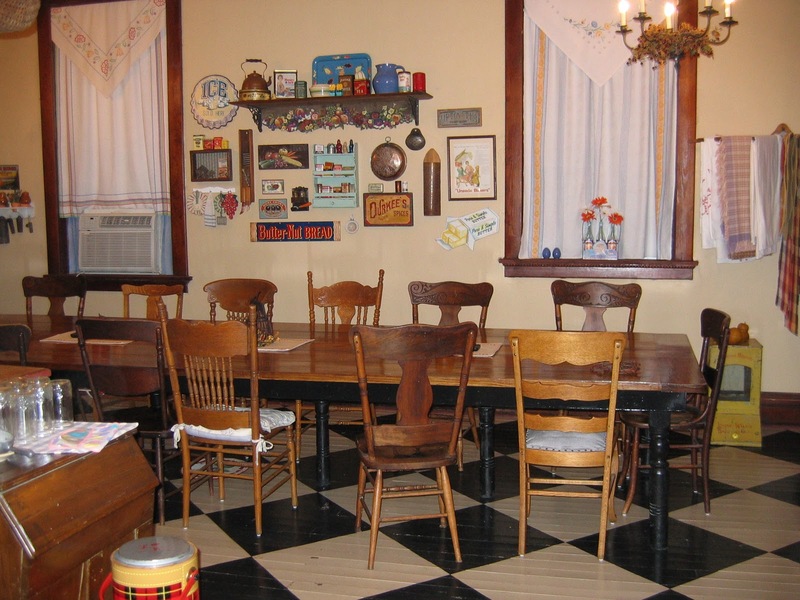 This time, my pals and I are headed to a big Folk Art & Antiques Festival downstate, and immediately after that....I escape to another friends lake home to sew, sew, sew. I promise to blog promptly once I'm home to stay. Sparking lamps were popular in the early 1800s for monitoring the length of time a gentleman caller could spend with the object of his affections. The young man was permitted to remain in the woman's home for as long as the lamp remained lit. 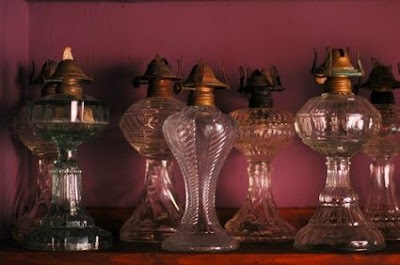 Sparking lamps were made in a wide variety of sizes with some so small they held only a thimble of oil. If the folks didn't like the gentleman when he came a'courting, they could pull out the smallest lamp, and when that thimbleful of fuel was gone, he was out the front door! Lynne Hagmeier (Kansas Troubles) and I were absolutely delighted to be invited to teach at the next Camp Blanding Retreat! This twice yearly event, held at the Camp Blanding Army base in Starke, FL (near Jacksonville), is hosted by our dear friend, Gloria Parsons. 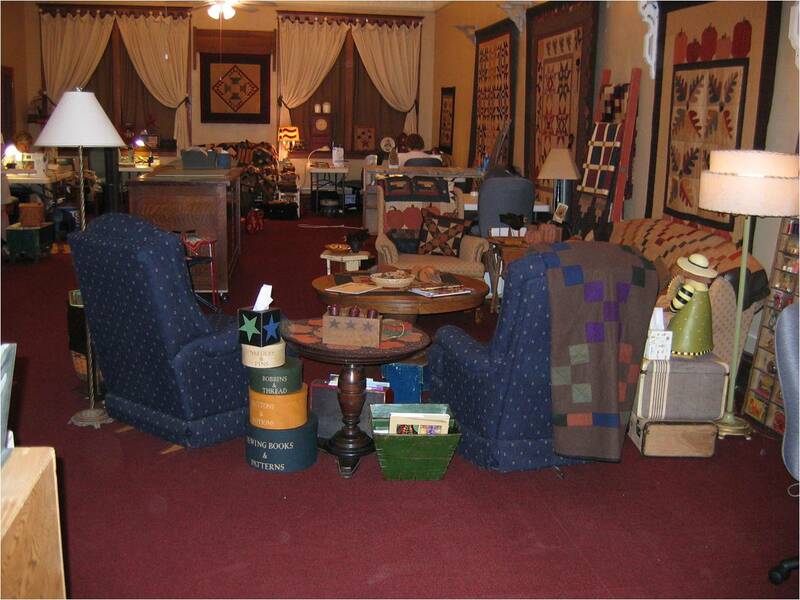 Gloria owned the famous Olde Green Cupboard quilt shop in Jacksonville, FL. She has since closed the shop but remains very active with her pattern business, teaching classes, writing a wonderful blog, hosting retreats, and has many other new surprises up her sleeve coming in 2013. The dates for our Camp Blanding retreat are Friday, January 25 through Tuesday, January 29, 2013!! Click here to find out more about our Great Girlfriend Getaway to Camp Blanding. Space is very limited! Click here for more information about our 2013 Great Girlfriend Getaway cruise to New England to see the fall colors! We only have a few openings left, and if you've been thinking about joining us, it's time to put your deposits down to hold your spot!! 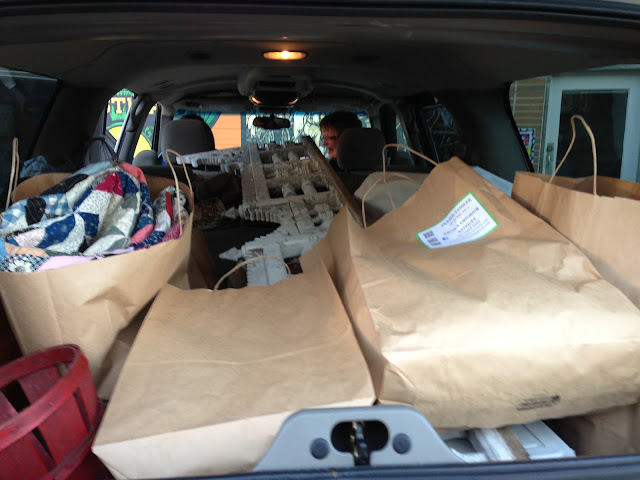 There's just nothing like getting away and sewing with girlfriends!! Lynne and I would sure love for you to join us!! Every market, I have to make a long, lingering stop to visit with friends Paula Barnes & Mary Ellen Robison of Red Crinoline (formerly Bonnie Blue), and take in their awesome booth. Isn't it great! They always have new lovely things to make....or pine over at the very least! 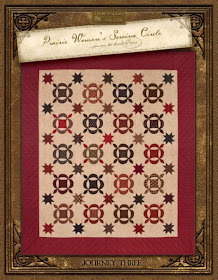 Sigh......To see all of Red Crinoline's patterns, click on the link above. 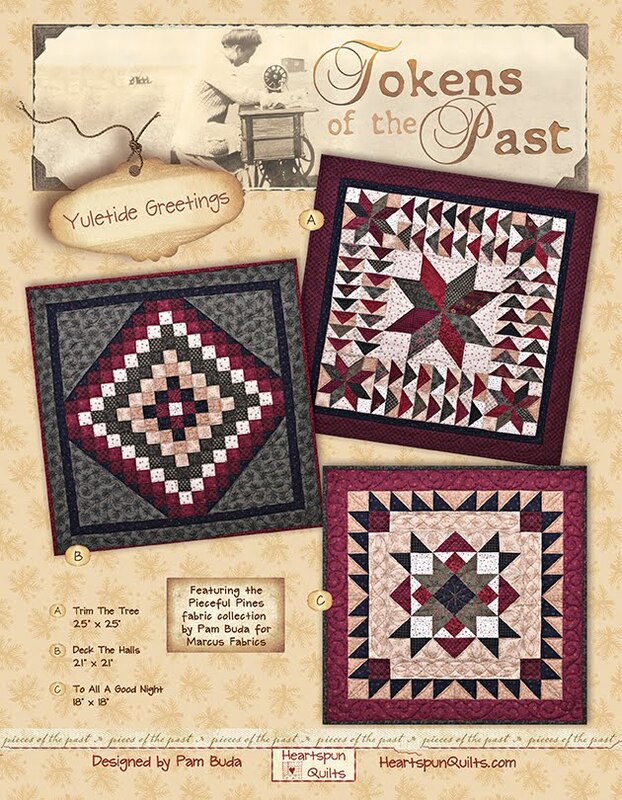 This is friend Annemarie Yohnk of Quilts Remembered. 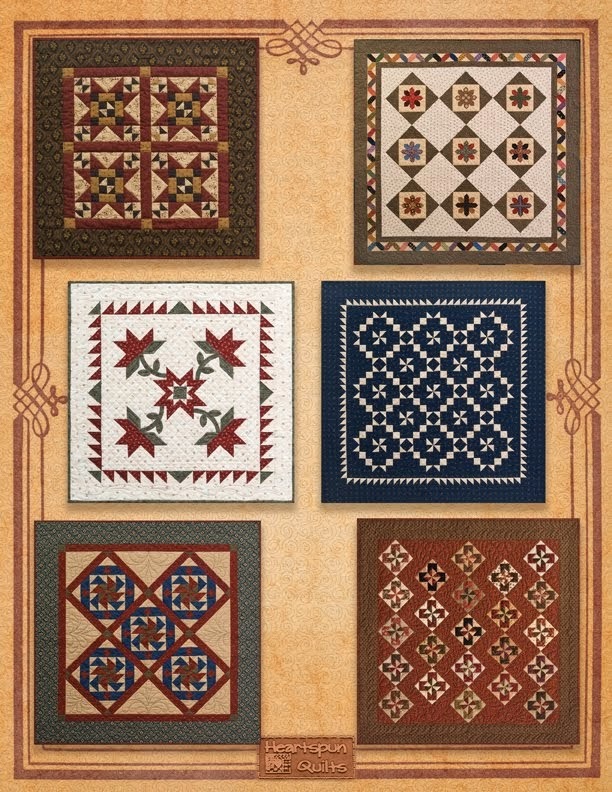 She has lovely vintage reproduction style quilts. 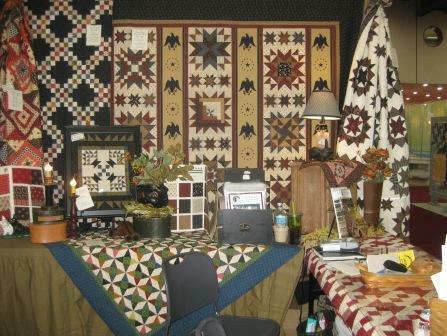 I could hardly take my eyes off of the quilt in the center of this photo. 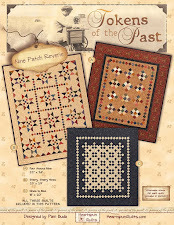 from Quilt Market. Annemarie named it Four Score. 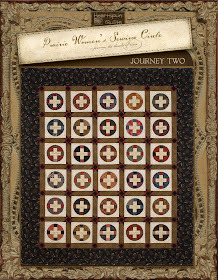 You can see the pattern and all her new patterns by clicking on the link above. Here's all the new goodies from Celine Perkins and her company Perkins Dry Goods. What's not in the picture is Celine's Perfect Piecing Seam Guide. and how it can help you with accuracy in your 1/4 inch!! I'm so excited to tell you about Char Hopeman's new ruler!! Char created the Flip Flop ruler that does some pretty amazing things. the ruler one way and cut, then flip it around to cut the other direction. See the block cut from the strip set? the Flip Flop ruler!! What fun!! 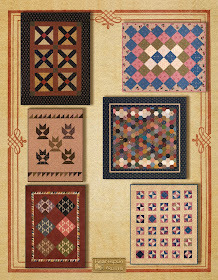 Char's patterns for her company Cotton Cottage Press. 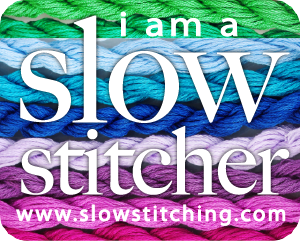 work hard to bring you exciting new projects to keep you in stitches! !